Just by luck, only a few weeks after the Jackson Streetcar map appeared on MissPres, the City of Biloxi Public Works Department has created a map that shows the route of old trolley lines. The idea of the map is to help them determine the possibility that they might run into old trolley tracks when they are working on road projects. 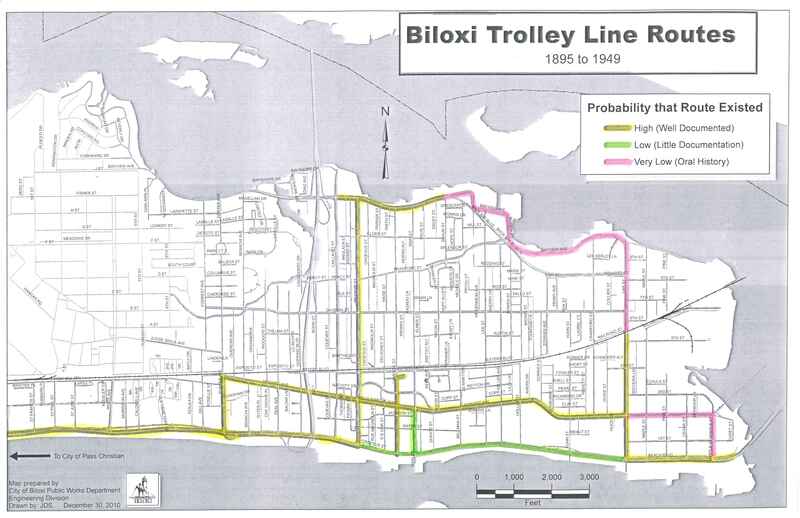 Lucky for us it give us an insight to the history of trolley lines in Biloxi during the first half of the 20th century. The lines shown on the map were in service anytime from 1895 to 1949 and during that time service was provided all the way to Pass Christian. The lines were probably constructed by several companies over the years including, the Biloxi Electric Light Company (est. 1894), Gulf Coast Electric Railway Company (est. 1895), Biloxi Street Railway Company (est. 1895), Biloxi Electric Railway & Power Company (est. 1903), and the Gulfport & Mississippi Coast Traction Company (est. 1905). Unfortunately the map doesn’t say if the routes were ever all in service at one time. But it’s great to see the different levels of documentation called out on the map. I was hoping I was going to see that they were planning to build a new trolley system. Then I saw the part about road work. Oh well…maybe they’ll build a new light rail system some day. It would make sense for them to have a way for tourists to get around from the casinos to other parts of the city- and Gulfport as well. I know they have the “trolley bus” system, but that’s not the same. At least they have done some good research! Great find on that report! Its a c2006 report from the “sky’s the limit” days of post Katrina. The light rail is one of the more realistic suggestions of the report. I hate to be negative, but I doubt it’ll ever be considered let alone be implemented. If it does happen I will happily eat my Cajun Reeboks with a side of remoulade.